Swathi Veeravalli is a member of the Center for Climate and Security Advisory Board, and an an interdisciplinary research scientist at the Geospatial Research Laboratory, Engineer Research and Development Center, US Army Corps of Engineers. Since 2010, she has been Principal Investigator on several basic and applied research projects where she focuses on developing the capability to better understand the impact of climate variability upon humans and the environment. Prior to government service, Swathi was a water analyst at Global Water Intelligence, where she assessed and monitored water, wastewater and desalination projects of the international water industry. She also helped coordinate a World Bank longitudinal study examining the productive uses of piped water in Kenya. 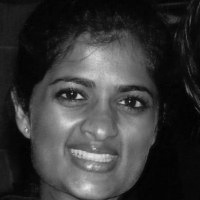 Swathi has several years’ experience in international development, youth engagement and advocacy. Swathi holds a Master’s of Science in Water Science, Policy & Management from the University of Oxford. At Oxford, her research focused on peri-urban water development with fieldwork in Kenya and Botswana. Swathi also holds a BA in International Affairs with concentrations in African Politics and Development from the George Washington University. She has worked and travelled in over 68 different countries.